Lao Restaurant + Bar is my new favorite restaurant in Greensboro. It's quickly becoming like another favorite, Bandito Bodega, where everything is just amazing. The atmosphere is upscale and modern, service is prompt and the food is absolutely incredible. But let me back up. Lao Restaurant + Bar took over Crafted's old space on Elm Street in downtown Greensboro. 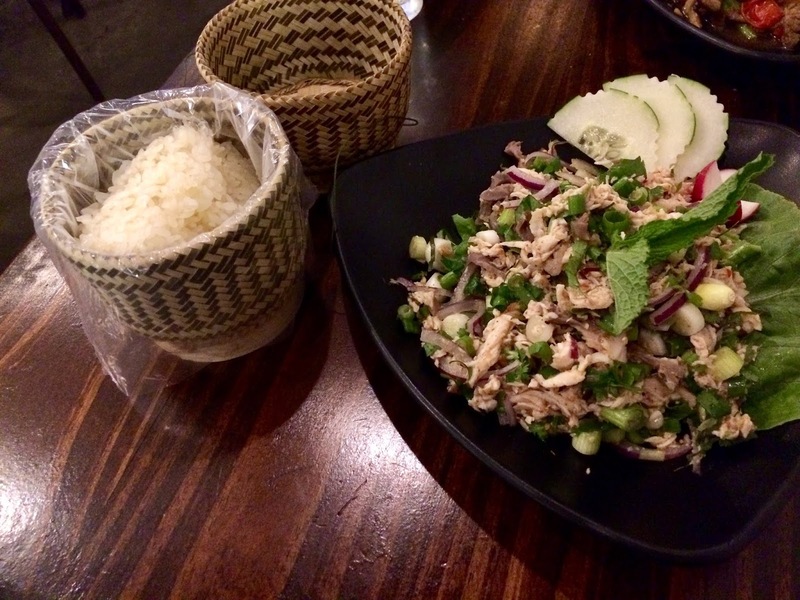 The dining room is still in the back, the bar is still on the side, but the cuisine is Laotian. A country neighboring Thailand, Laos' cuisine is very similar to Thai food. It's all the expected flavors - cilantro, curry, mango - but it's just different enough that you might not recognize any of the dishes. (Instead of Pad Thai, you'll find Laab.) Greensboro has been needing a place like this, and I can't wait to eat my way through the menu. I was impressed with the extensive cocktail list, and even more impressed that the heat in the Spicy Thai Collins was prevalent. "How well do you handle spice?" asked my server after I ordered the drink, featuring muddled jalapenos, cucumber, Thai basil, lime juice, gin, simple syrup and soda. The heat was exactly the level I was hoping for - and not for the faint of heart. The Sake Sour is also a delightfully light cocktail, with sake (most likely unfiltered/cloudy), lemon juice, egg white, simple syrup, bitters and pineapple juice. Gotta love a cocktail that features egg white, to give it that frothy look and texture. Loving these cocktails - off to a great start! I've had Laotian food one time before, at Bida Manda in Raleigh, but I wasn't familiar enough with the cuisine to quite know what I was ordering. Laab is one of the more well-known Laotian dishes, so I started there. It's a cold, chopped meat salad - and tastes way better than that description. I chose chicken for my protein, and it was seasoned with a spicy lime sauce and fresh herbs. I wasn't prepared for the number of red and green onions in the dish, and was pleasantly surprised to find no offensive, overpowering onion flavor. It was absolutely delicious. The dish was light and refreshing, and the mint and cilantro brightened it up. Lime juice provided great acidity, and if you request romaine leaves, you can make your own little Laab burritos. I am also obsessed with the little rice cart that my sticky rice came in! Kua Mee is a sweet and savory stir-fry noodle dish, topped with an egg omelette, your choice of protein, bean sprouts and all the cilantro in the world. For a cilantro lover like myself, I grinned ear to ear when I saw the big bunch of green to brighten up the dish. I chose Pork Belly as my protein, and was happy that it wasn't too fatty. It was like a thick-cut bacon, and added a nice salty bite to the caramelized flavor of the noodles. What's an omelette doing in there, you ask? The same thing it's doing on sushi menus - just try it, you'll like it. 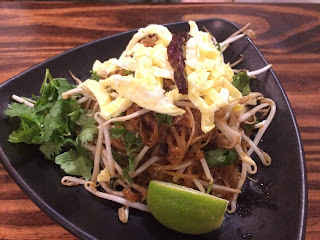 Kua Mee with egg omelette and loads of cilantro! I thought the Kua Mee was the best thing ever, until I tasted the Mee Katti, a red coconut curry with rice noodles, peanuts, whipped egg, cabbage, bean sprouts, cilantro and your choice of protein. The heat was noticeable but not overpowering, as was the coconut flavor. I chose chicken as my protein, and it was so tender, I couldn't tell whether I was eating the chicken or the egg. The peanuts added a lovely nutty crunch, and the cilantro again...I was a happy girl. Kua Prabang features tender flank steak, with green beans, green onions, red bell peppers and mushrooms in a wildly flavorful sauce. This is not your average stir-fry. Add in rice, which gets coated in that delicious sauce, and you've got a hearty, familiar, yet new dish. My third favorite dessert in the world is Sweet Sticky Rice with Mango (behind Bananas Foster and cake from Maxie B's). If you like Rice Pudding, you'll love this dish. If you don't like Rice Pudding, you'll probably still adore it. I squealed when I saw this traditional Thai dish on the menu. There's almost a buttery popcorn flavor in the sauce that gets drizzled over the sticky rice, and the sweet acidity of the mango gives this dish a really amazing balance of flavor. Sesame seeds are more for aesthetic and a teeny crunch, but no sweet sticky rice is complete without it. I am elated that this restaurant is in downtown Greensboro, and they're open for lunch! If you haven't been, or are nervous about trying a new cuisine, get outside your box! Support local businesses! I love introducing my palate to new flavors, and hope this post has inspired you to do the same.